Scouted from a local junior league in which he won the most outstanding player, Ebrima Bojang alias EB has improved well within his eight years stay in the academy. Tall, sturdy and strong Ebrima uses these physical qualities to cement his position in the academy. His assets are he is a good man marker, good ball winner both on the ground and on air, accurate passing and shooting, good aerial combat, strong header and above all his ability to coordinate the defence in the thick of actions as well as a complete team player. At the moment he is one of the most experience defender, as he is currently on loan with Real De Banjul a first division side. 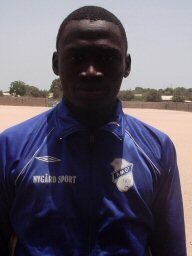 His laurels includes; he has been the captain of the academy’s under 18 as well as winning the championship with Real De Banjul in the 2006/07 league in which he contributed well, last year he played a record 18matches out of the possible 22matches and has this year continued his fine form even though the team struggled to pick form during the first round of the national league.